In Philly in the mid 60’s, it seemed like every girl in town, black, white or yellow wanted to be in a group like the Supremes or Martha and the Vandellas. Yet tonight, I found myself singing along with three white British guys in ultra glamorous drag, knocking the crowd at Madam Jo Jo’s out of the room with their own unique take on hits by those super girl groups we all love to sing along with and many more. The Supreme Fabulettes feature three fabulous but distinctly different singing voices, courtesy of dark haired Miss Vicki Vivacious, red headed Miss Mary Mac and blonde Miss Vanilla Lush, who are each so immersed in their onstage identities it’s easy to lose sight of such things as aliases. From their first dramatic entrance in unison, amid a haze of mist, recalling dry ice days of yore, long, wing like sleeves of their bronze, floor length gowns shimmering through the swirling fog, the audience was in the palm of their bejeweled hands. When they began to sing, in soulfully sweet, tight harmonies, alternating on dynamic lead vocals showcasing range, the deal was well and truly clinched. As I write this, I’m aware of the untimely death of Donna Summer, Queen of Disco and acutely aware, as I listen to ‘I Feel Love’ at top volume, of the many ways music penetrates the subconscious, seemingly, taking root and flowering there, time and time again. The Supreme Fabulettes are aware of that too, and their dazzling performances, complete with mannerisms and gestures ever familiar, yet somehow, distant in the tides of time, enable their modernised musical arrangements by John Themis, best known for working with Boy George and Culture Club, to become all their own. There are definitely, traces of blue eyed soul, a la George, in turn inspired by countless singers before him, in this group’s supremely satisfying mix. So, paying tribute, without mimicking, flattering without flattening, reaching without over-stretching…These three performers are each such fan-tabulous singers in their own rights that I would never want to have to choose between them as to who is best. In my eyes, they’re all solid gold! Rather than seeking replication of past hits, recorded backing tracks used here allowed fluidity of voice and movement and further enable the smooth blending of hit songs from various eras, in one such case, ‘Survivor’ by Destiny’s Child, and You Keep Me Hangin’ On’ by The Supremes. I once saw Mary Wilson, during her days of wanting to leave the Supremes, wondering if it was a good idea for her to do so. She was glamorous, poised and elegant. At 14, I was gangly, awkward and shy. Back then, it was Martha Reeves who always wowed me, followed closely by Ronnie of the Ronettes and Aretha Franklin. But one of the supreme wonders of this group is that there’s no telling what combination of songs they will treat their audiences to. The Supreme Fabulettes are seemingly, prepared to sing anything, with their Girls Aloud/Supremes/Three Degrees/Martha and the Vandellas, Tina Turner meets Sister Sledge mix. Small wonder, as Vocal Arranger Terry Ronald has worked with Kylie Minogue, Cheryl Cole and other glam gals. 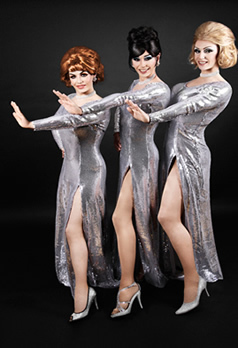 Whether you like any of those performers and their music or not, when you see the Supreme Fabulettes live, you’re sure to agree that they are themselves, equal to all of those divas and more. Why? Because they have all of the perpetually precocious girly moves, and hilariously notorious inter-group rivalry that we’ve heard about in super groups over the decades, but it’s never over-done, just coyly touched upon, then, slyly slinked past. You go girls! Katie Ella Hardwick’s succinct, ‘always something there to remind me’ choreography also had the mixed age audience strolling down memory lane, recalling that it wasn’t just male groups like The Temptations who had steppin’ style down pat. Watching performers doing synchronized steps out of their original time slot could be funny. Here, it’s supreme laughter of recognition, always welcome, which delights. It is rumored that The Supremes had upwards of one hundred wigs apiece. That said, I must add that costume designer Stevie Stewart had her finger right on the mid-sixties pulse when she dreamed up her rich creations for this trio, right down to their soft red satin gowns with column like skirts culminating in a tremendously bouffant bunch of red ruffled netting at their hemlines, making one think of dyed French poodles Ms. Audrey Hepburn may (or may not) have walked onscreen. Motown was nothing if not classy and ever glamorous, taking fashion trends to new heights, rather than merely following them. The Supremes almost made having a broken heart seem like fun in buoyant sounding songs like ‘Where Did Our Love Go’ and ‘Baby Love’. If only life were that easy. But hey, life’s always easier with a song, and given their talent, lovingly tongue in cheek, thoroughly enjoyable delivery, and droll, well observed pastiche enactments, splashy entrances and infectiously hilarious onstage love-hate camaraderie, the Supreme Fabulettes are one unique cross dressing act destined to become a huge cross over sensation! Editor’s Note: Please excuse pun (love)…! By the way, I’d never been to Madam Jo Jo’s before, but it’s one great little venue, with atmosphere to spare, so I’ll definitely be heading there again.